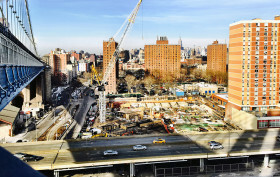 The construction of Extell’s high-rise condo development at the foot of the Manhattan Bridge is now well underway. 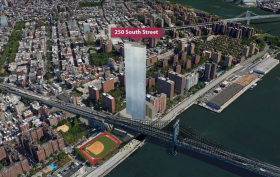 When complete, 250 South Street (formerly 227 Cherry Street) will rise more than 80 stories above the East River and be home to just under 800 units, but that’s not all. As the Extell building goes up, the surrounding area is also attracting growing attention from other developers. In July, JDS Development announced plans for a rental development just next door at 247 South Street. Given the scope of the Extell development and its neighboring rental development on South Street, thousands of new residents are expected to arrive in the Cherry Street neighborhood between now and 2020. Of course, there are many neighbors who arrived first. 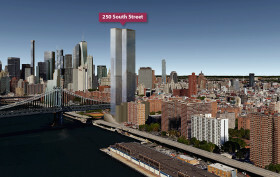 Still in disbelief that a 68-story building (though it’s being marketed as 80 stories) could rise at the edge of Chinatown? Well behold One Manhattan Square‘s construction site, buzzing with activity and flagged by a stalwart kangaroo crane foreshadowing the 850-foot-tall tower to come. Unlike the Chinese investment market, Extell’s skyscraper is heading in one direction — up. And after more than a year of site preparation and foundation work, the first pieces of re-bar have emerged from their mucky surrounds and are peaking above the lot’s blue construction fences. Extell hasn’t been making many friends with its new tower currently on the rise at 250 South Street, right next to the Manhattan Bridge. But even with hordes of locals cursing the mega-sized 80-story tower, Extell seems unfazed by the hate. Not only have they been unwavering about the development’s 850-foot out-of-context height (the Manhattan Bridge is only 330 feet tall, mind you), the developer also has little interest in selling any units to anyone stateside, instead marketing their condos first to Asian buyers. Bloomberg News reported yesterday that the restless developer Gary Barnett will soon begin marketing the 800 condominiums of his upcoming One Manhattan Square development to Asian buyers first. 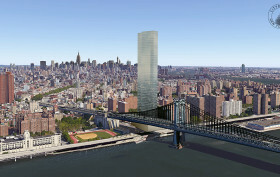 Apparently not satisfied with erecting two of the tallest and priciest residential buildings in the city, One57 and the Central Park Tower, the Extell Development Company founder and CEO is busy laying the groundwork for one of the largest condominium towers in the city at the foot of the Manhattan Bridge. Going by the address 252 South Street, the bipartite tower is being designed by Adamson Associates Architects (AAI) and will soar 80 stories tall, roughly to the same height as the Comcast Building (former GE/RCA Building) in Midtown. At nearly 850 feet, the tower will be the tallest skyscraper on the island between Midtown and downtown, and by far the tallest building directly along the waterfront. 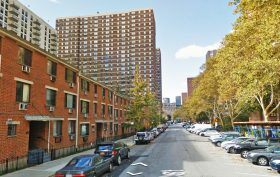 Its staggering 800 units will fall just short of the city’s largest individual condo-tower, the 816-unit Corinthian in Murray Hill. Since its reveal last year, the tower has been met with intense public outrage due to its unprecedented height for the mid-rise neighborhood. 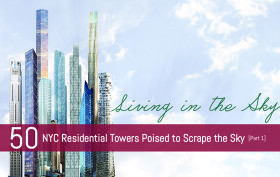 The building was first reported to be 68 stories, then 71 stories, then 56 stories, and now the latest filing with the Department of Buildings has a revised height pinned again at 68 stories, or 800 feet at its highest floor. To put that in perspective, the neighboring Manhattan Bridge is only 330 feet tall, and just 170 feet at its roadway—meaning the building will be nearly five times the height of the bridge’s road deck. 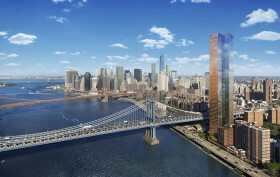 Here’s your first look at Extell’s new tower popping up just north of the Manhattan Bridge along the East River waterfront. Spotted by Bowery Boogie on the construction sign at the 250 South Street site, the somewhat vague rendering is short on design details but manages to show a behemoth ready to dominate the area. While details of the design remain scarce, public documents reveal a two-towered development of 68 and 23 stories to rise atop a three-story podium that will contain 30,000 square feet of retail. 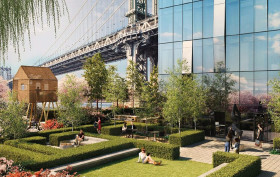 Blogger Bowery Boogie uncovered the residential amenity package, which will include two swimming pools, a health club, basketball court, squash court, bowling alley, golf simulator, and 137 on-site parking spaces.